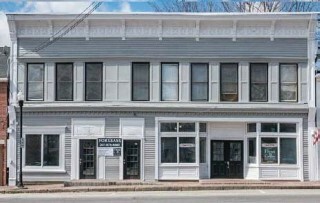 Flynn & Company Real Estate is celebrating its 26th year with a grand opening of their newest and third location at 5 Main Street in Gray. Flynn & Company’s straight forward approach to selling homes and representing buyers has made them a top real estate company in Southern Maine. 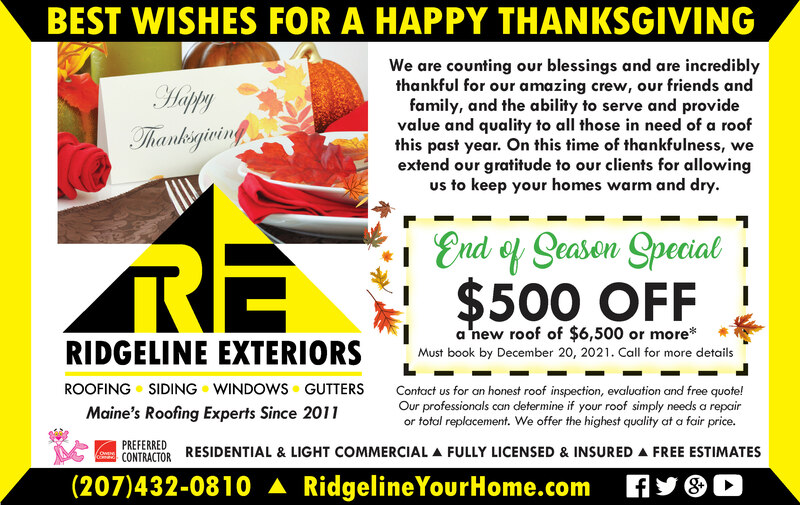 Under the direction of president Joe Flynn, the company has sold close to 2,000 homes in the region over its many years in business. With a total of six agents, Flynn & Company is ready to place you with the agent that is the right fit for what you are looking for be it residential, light mixed use or commercial property. “We offer the power of a greater Portland agency with a physical presence in the lakes region,” said Flynn. A few of the agents have rated in the top five for sales volume in the State of Maine in past years. They are moving inventory at a fast rate. When selling a house choosing the correct agent is important. Flynn & Company’s average number of days on the market over the last six to eight months is four, many homes sell in one day. “We try to price them right and get a bidding war going. Everything has been going quickly because of the low inventory,” Flynn said. Flynn & Company has a proven track record when it comes to working with elderly clients who might be ready to move out of their homes or their children are asking them to move into assisted living. Often times it is a family or the grown children who are selling the house in these instances. “We work with elder attorneys and helping a client who wants to sell the house with his five brothers and sisters,” Flynn said. They are sympathetic and ready to help ease the transition for all involved. There are two other offices in addition to the one in Gray, which has been open for just over two weeks, the main office at 918 Broadway in South Portland and the second office at 918 Forest Ave. in Portland. Each office has its own niche in the community. In Portland, they specialize in condominiums on the east end and west end, and development work. In South Portland, they do a lot of regular residential business. In the lakes region office, they expect to work with clients who are looking for lake properties and camps in the area. Flynn and other agents are familiar with the Sebago region because they own property in the area and are ready to sell others a lakefront dream. market you can not just put up a for sale sign on a home and hope that it sells. Our aggressive marketing plan for our listings includes professional pictures taken by our photographer, Internet advertising, print advertising and the electronic sign,” said Flynn. The electronic sign sits at the Portland office and is seen by 30,000 cars each day. In addition to promoting the lakes region listings to the Portland market, they also offer a client moving van. Starting this week, they are offering use of a brand new 2016 Ford Cargo van to anyone who buys or sells property with them. Flynn & Company primarily works with clients in York and Cumberland counties from the Lewiston area down to York. On their website, they have listings from all over the state. For more information or to see listings, visit www.flynnisin.com. Sebago region. “The area needs a reliable taxi. I serve all of Cumberland County and Maine. I’ll take anyone wherever they need to go,” Morrison said. Lakeside Taxi just opened last month and already Morrison has helped people get home safe. A wife called Lakeside Taxi at 1 a.m. to have Morrison go pick up her husband and his friends who were stranded in Naples. “I was open and able to go get her husband and his friends and bring them home safely,” he said. He also drove a bachelor party around so they didn’t have to worry about transportation. Morrison is a native of Vermont, but he moved to Raymond five years ago. He’s a cook by trade, but has done a lot of different jobs including driving a taxi for eight years and driving a truck cross country. He was also a background actor in California. After all of his experiences, he has decided to settle here to help people. “I’m 24/7, 365. My goal is to help do away with drunk driving offenses and get people home safe without criminal offenses,” Morrison said. The father of adult children, he has always been concerned about drunk drivers. Years ago one of his uncles when to a party with a friend and while riding on the back of a motorcycle he was knocked off and fell into a coma and later died. He doesn’t want that experience to happen to anyone else. The cost of an OUI charge can run into the $10,000 range. The money that could be saved by calling Lakeside Taxi is staggering. Plus there is no loss of license, no loss of job, no increased insurance rates and no being dropped from the insurance company, Morrison said. He’s more than just a taxi service however. He is willing to be a delivery service as well. “I can get people home safe after a night of drinking and can do delivery services from a restaurant for a fee,” he said. From McDonalds to Hannaford to Go, Morrison will pick up an order and deliver it to the customer. This would be convenient for the elderly or disabled, when weather is bad and they can’t get out. A mother who needs medication for her child and can’t leave the house, Lakeside Taxi to the rescue. The need for a taxi and delivery service is what motivates Morrison. “I’m 10 minutes away. People need to get from point A to point B. It cuts down on emissions and is safer,” he said. Morrison drives a 2004 Chevy Impala that seats four people plus the driver. Right now Lakeside Taxi only has one driver, but Morrison’s goal is to have five taxis be the end of the year with 10 drivers and two limousines. “The area needs it. If you want anything now you have to call Portland. I am the Raymond/Windham transportation resource,” he said. With Lakeside Taxi, people don’t have to be late to work anymore. Trouble getting your child to school, call Lakeside Taxi. The company is available for any type of events and courier services. Starting in November the company will be offering package deals on casino trips to Oxford Casino, Mohegan Sun and Foxwoods with a per person price for round trip same day service. Lakeside Taxi is fully insured. The cost is $3 per mile cash or credit. They accept all major credit cards. Repeat customers qualify for a discount. Lakeside Taxi also offers flat rate fees to airports. It’s $125 to Manchester Airport, $35 for the Portland Jetport and $150 for Boston’s Logan Airport. Would you rather ride in the back of a police car or in the back of a Lakeside Taxi…it’s your choice. For more information or for a taxi, call 207-655-6303 or email email@LakesideTaxiMaine@gmail.com. In a calm and restful place on the corner of Whites Bridge Road and Route 302, massage therapists Jacquelyn Winant and Deanna Raihl have settled into a new shared space that is designed to help nourish their clients’ bodies, minds and souls. “The new location is much nicer and the location is premium and easier to find,” said Winant. After being a massage therapist since 2003, Winant plans to take her business to the next level offering classes and coaching in addition to massage. “I always knew I wanted to do something to help people. Not to be a nurse, but by touching,” Winant said. After a while she knew she wanted to help more people than by just doing massage, so she started life coaching. She also is a Reiki Master, does polarity, aromatherapy and is a yoga instructor. As a life coach, Winant sees herself as “an unbiased ear for issues their trying to work out. I don’t lead you, but help you find the answer. I don’t give advice, but I get you to the ‘a ha moment’.” Life coaching can be used for business, relationships, jobs and physical needs. “I help you see the big picture,” she said. “It’s the accountability. It’s a gift,” added Raihl. “It’s somebody to listen to you,” Winant finished. Raihl specializes in massage for chronic pain and injury. She helps reset the body using deep tissue pressure when needed. She does some counseling and coaching especially around nutrition. She hopes to start a yoga class for children and a sign language class for children starting in October. “I took the mental health approach,” Raihl said. She worked with at-risk youth for a while. She wanted to help them, but now helps others through massage, organic skin treatments and as a holistic health counselor. She also does organic spray tanning. “I try to stay organic throughout my business,” she said. On Saturday, September 10th, Healing Arts & Well-Being will host an open house for anyone interested in learning about holistic care or those who want to experience all Healing Arts & Well-Being has to offer, from 1 p.m. to 4 p.m. There will be a medium, henna tattoo artist, a representative from Isagenix, homemade soaps and a table to make roller ball applicators using DoTERRA oils. They will also have gift certificate specials and raffles. “We work well together and offer a lot of services. We’re a wellness center for mind, body and spirit,” Winant said. Their services are important for many reasons. “To learn how to deal with stress,” Winant said. “Because you’re important,” said Raihl. Winant offers restorative and gentle flow yoga classes during the week in their new large, comfortable space. Winant and Raihl are both teaching classes through Windham Adult Education this fall. Raihl will be teaching “Healthy Halloween” offering suggestions and alternatives to candy and sugar. She will also have another class about holiday eating and stress. Winant will be doing a class on creating Christmas gifts with essential oils. Those classes can be found online or in the Windham Raymond Adult Education booklet. Winant also hosts the Think Local chapter on Mondays from 8:30 a.m. to 9:30 a.m. for business owners to network. For more information or to schedule appointments, visit www.healingartsandwellbeing.com or call 207-400-4796 for Winant or call 207-482-0615 or visit www.deannaraihl.com. They both can be found on Facebook at HealingArts by Jacquelyn and Nourishing Self. on a sweatshirt. Today it’s a logo for a boating company, tomorrow it could be working to stitch initials on a child’s school backpack. At One Stitch at a Time clients are given special attention so that whatever they want, be it a logo, design or name, they will be pleased with the results. Sue and Garnett Johnston opened One Stitch at a Time about a year ago in their home on Albion Road. They are still in the same location, but they have expanded their equipment and their product lines over that time. 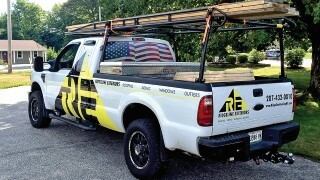 This family business helps to support their three children who are just out of college, one in college and one a senior at Windham High School. “We were looking for something we would be successful with on our own in the next chapter of our life,” Garnett said. With their new equipment, they are able to do a larger variety of types of objects to embroider on, including hats, bags and karate belts, for example. “We’re really excited about the hats,” Sue said. The company is working on hats this week to donate to a friend and her team, which will be participating in the Dempsey Challenge. One Stitch at a Time is a local business. “I find people would rather work with local people, not order on the Internet,” said Sue. Personal attention comes from working directly with a person, the same person who will be doing the work. Sue has been sewing and embroidering for a number of years. She tailors and alters clothes and has done that for many years. “I’ve been sewing and embroidering all my life. I got my first embroidering machine off a bulletin board at my work. I thought it would be fun.” The business is something she and Garnett plan to do on their own time so they can set their own schedule to meet their customer deadlines. Not sure what a logo might look best on? Sue can help with that as well. They work with a variety of distributors to get the best quality products at really good prices. They also have access to brand name Polo shirts, work shirts and more. With a library of 10,000 or more designs and a variety of fonts, Sue and Garnett can help choose what would look good on a particular item. If a stock image is not what the customer wants, they can take a customer’s design or logo and have it digitized for embroidery. One color or six colors, each design will be worked on until it’s exactly what was ordered. There is a one-time fee for digitizing the artwork, but their prices are much lower than national and local competitors, going up to $35 on average depending on the design. Also looking forward, Sue and Garnett are considering screenprinting, although they like that embroidery lasts longer and doesn’t fade. “It looks more professional,” Sue said. Embroidery can save families money when all jackets look alike, for example on a sports or dance team. Putting a child’s name on it means one less lost item. One Stitch at a Time can do designs up to 8 by 12 inches on the back of a shirt or jacket. Names can be done while a customer waits. Personalization is $7 per line on average depending on length. “We can ship anywhere,” Garnett said, noting they have worked with an irrigation company and a school out west. 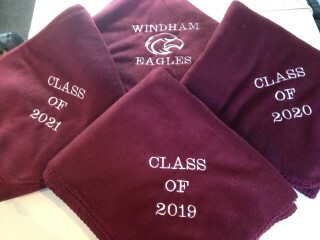 One Stitch at a Time will be at the Windham Boosters Craft Fair this fall, but there’s no need to wait. “Someone out there is looking for good quality,” Sue said. They found it at One Stitch at a Time at 126 Albion Road in Windham. They have a dedicated driveway near their sign. 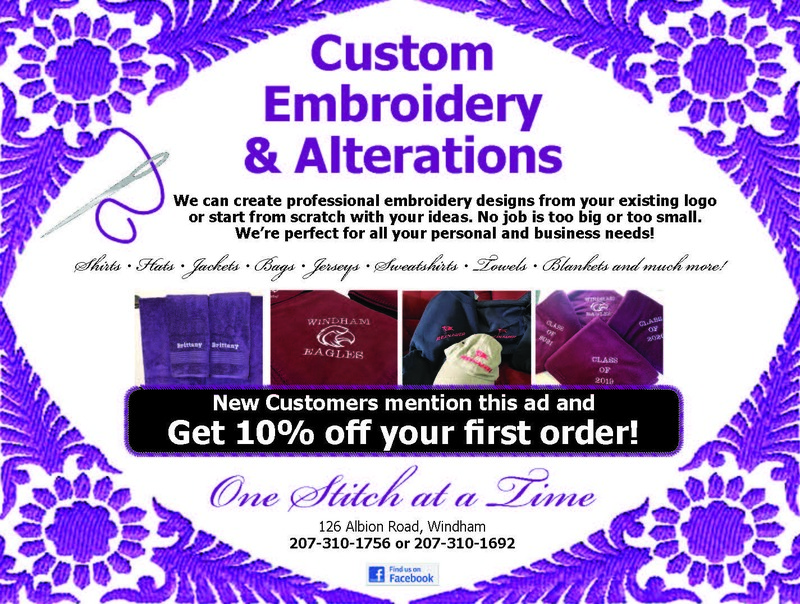 For more information, email onestitchme@gmail.com, call 207-310-1756 or 207-310-1692 or visit them on Facebook. They take all major credit cards through PayPal.